Kapparot (atonement) is a ritual preceding Yom Kippur in which many Orthodox Jews swing chickens around their heads while reciting a chant about transferring the punishment God would otherwise confer on them onto the birds. The chickens are then slaughtered, on or off the premises, or simply abandoned or thrown into garbage bags. Kapparot chicken “swinging” defenders claim the ritual is “compassionate.” This claim is completely refuted by eyewitness accounts, photographs and videotapes documenting the suffering, crying birds and the callous treatment they receive at the hands of the practitioners. Kapparot practitioners typically hold the birds with their wings pulled backward. This is a painful experience and potentially injurious to the ligaments and tendons of these birds, who have already sat miserably cramped in transport crates, often for days without food or water, before being “swung.” The abuse of these birds is fully consistent with the fact that kapparot practitioners regard them as mere symbolic receptacles for their personal punishment. 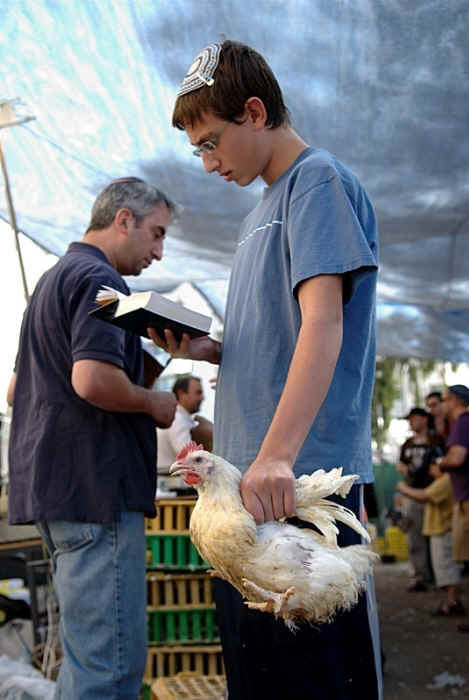 The use of chickens in kapparot rituals is not required by the Torah or the Talmud. Most observers swing coins for charity. In recent years, a groundswell of opposition to the kapparot chicken “swinging” and slaughter has been growing in New York City, Los Angeles, and Jerusalem. People are sick of the animal cruelty and want it stopped.